Griffith Art Gallery is pleased to offer this original acrylic painting on stretched canvas in a custom frame. The size and price includes the frame. Crating and shipping available. Contact Griffith Art Gallery at 205-985-7969 or email griffithgallery@bellsouth.net for more information. 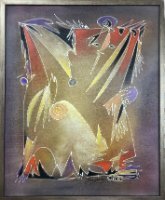 Griffith Art Gallery is pleased to represent original paintings on canvas by Hungarian born artist Janos Kardos.